The Mona Lisa has much to tell us about humanity. Visualization, The nature book of Art and Science. by Martin Kemp. Berkeley, Ca. : U.C. Press, 2000) pp, 12-13. Leonardo da Vinci, The Mona Lisa, La Giaconda, oil on canvas, 1503-1513. The Louvre, Paris. Leonardo da Vinci, April 15, 1452–-May 2, 1519 (Amboise, France). "a portrait of the particular woman to convey the universal laws of nature, proportion, reason, complementarity, and the fit of our microcosm within the macrocosm." 1. light , incidence of. There is an order to nature represented in art to convey the rationality, proportion, and measure of the world from our human experience of the cosmos. "less a portrait and more a universal statement." "The portrait may have been painted to mark one of two events - either when Francesco del Giocondo and his wife bought their own house in 1503, or when their second son, Andrea, was born in December 1502 after the death of a daughter in 1499. 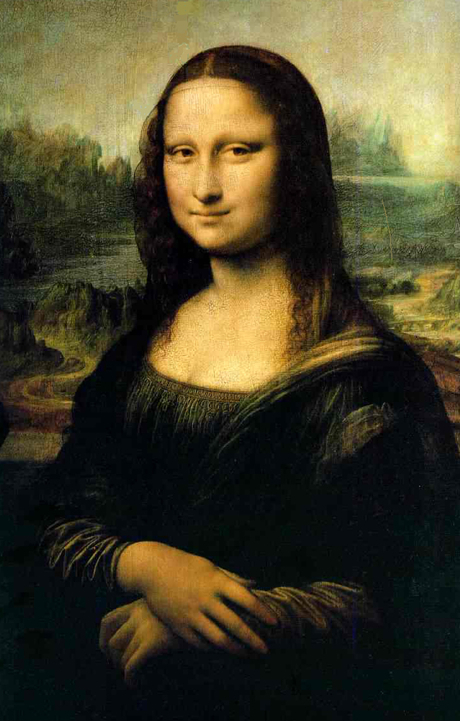 The delicate dark veil that covers Mona Lisa's hair is sometimes considered a mourning veil. In fact, such veils were commonly worn as a mark of virtue." "The figure is shown in half-length, from the head to the waist, sitting in a chair whose arm is resting on balusters. She is resting her left arm on the arm of the chair, which is placed in front of a loggia, suggested by the parapet behind her and the two fragmentary columns framing the figure and forming a 'window' looking out over the landscape." "The perfection of this new artistic formula explains its immediate influence on Florentine and Lombard art of the early 16th century. Such aspects of the work as the three-quarter view of a figure against a landscape, the architectural setting, and the hands joined in the foreground were already extant in Flemish portraiture of the second half of the 15th century, particularly in the works of Hans Memling. However, the spacial coherence, the atmospheric illusionism, the monumentality, and the sheer equilibrium of the work were all new." Kemp argues that art is as often allegorical as it is representational in the strictest sense that the subject is an expression of what the artist sees and then tries to paint, sculpt, or otherwise render as an artwork. 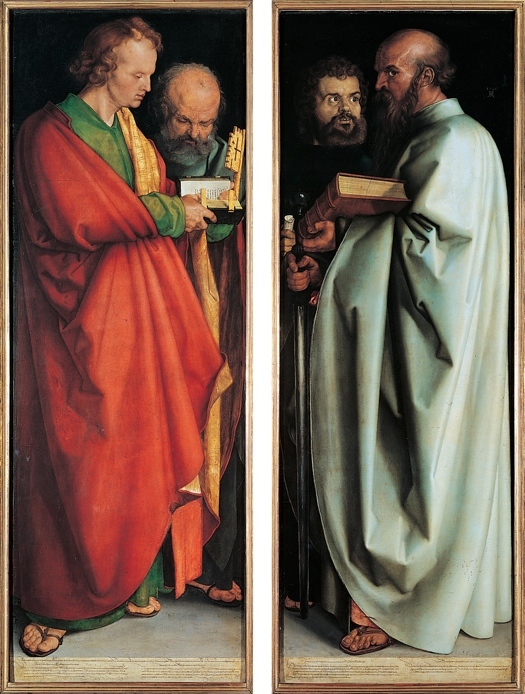 Albrecht Dürer German Renaissance painter "presented the town council of Nuremberg, Germany, with an extraordinary gift: a painting consisting of twin panels portraying four New Testament authors, accompanied by didactic verses drawn from the writings attributed to each evangelist. Kemp suggests that the painting also represents the older idea of the four humors or four elements from ancient medical theories about health arising form the condition of our surroundings and how humans manifest in the microcosm the four elements that comprise the macrocosm of the universe. Is vegetation the Earth's flesh? Water is the blood of the Earth. as mountains are (protruding rock) its bones and the wind its breath. Martin Kemp. Visualization, The nature book of Art and Science. Berkeley, Ca. : U.C. Press, 2000) pp, 12-13.